Here is a great video by PBS published May 13, 2011 that explains the power of crisis mapping. They explore its use in Haiti to the most recent crisis in Libya. 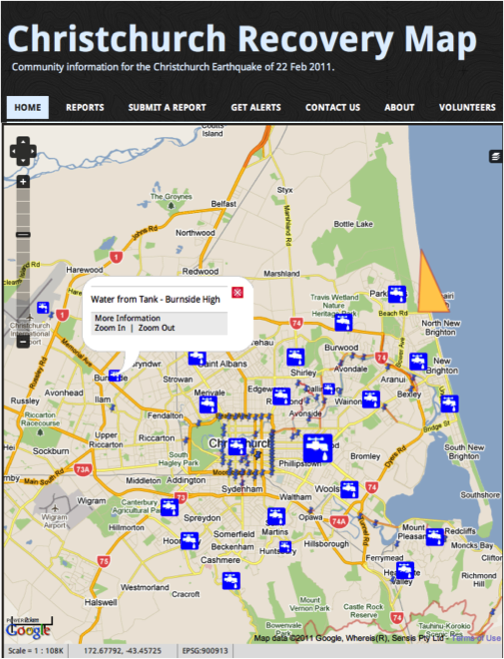 This extraordinary ability to connect has turned a modern convenience into a lifeline through a system called crisis mapping. It first gained prominence after the earthquake in Haiti, when people used their cell phones to send text messages to a centralized response team. Since then, crisis mapping has been used to help victims in emergency zones following the tornadoes in the Midwest, the earthquake in Japan and the unrest in the Middle East. Crisis data, it’s not just for response organizations. For instance, volunteer technical communities that mobilize resources early on aggregate and map information from the crowd. This is a complementary activity to those serving in official capacities that are responsible for critical infrastructure and emergency response. There are other examples that also show this complementary nature of efforts that may or may not duplicate data sources, but serve specific populations and needs at varying points of the response. The nature of this complementary data was discussed a bit in a conversation this weekend about the upcoming National Level Exercise ’11 with Heather Blanchard of CrisisCommons. We talked about the importance of everyone–citizens, government response organizations and NGOs, having access to data that she calls community indicator data. Community Indicator Data could be defined as any data regarding the location and state of the infrastructure that serve the affected community. This could include: shelters, grocery store availability, communications (i.e. state of cell phone towers and telecoms) hospitals, banking/ATMs, water, fuel, power, etc. Some of this data can be highly localized and can fluctuate often during the recovery. But as Ms. Sutton also points out in her article, for citizens, it is important to be able to access this information in a meaningful format. The “ownership” of this data varies widely. Some of the information is from the private sector (e.g. grocery stores, fuel, power); some is from non-governmental organizations (e.g. shelters and feeding centers); and some is citizen or user-generated (e.g.”I’m willing to open my well of clean water for those who live nearby). User-generated data can be curated by volunteers from social media feeds such as twitter, news feeds, and/or blogs, etc or can even be sent directly to those curators via text message or email. The crisismapping community understands that citizens need access to all of this information–not just response organizations. Their contribution is to analyze, sort, validate and format this data into visualization platform–the picture above is of a Ushahidi map from Christchurch, NZ of available fresh water after the quake. 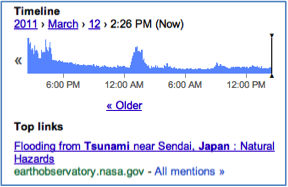 Google has also taken up the role of sorting, filtering, and visualizing crisis data as is evident in their expanding and ongoing role in the aftermath of the Japan earthquake . Their public policy blog details the resources they have made available to all involved: impacted citizens, concerned family members, news media, first responders, and volunteer organizations. The person-finder application has now been deployed for many disasters, and it was up and running with two hours of the earthquake. It seems they have learned from each deployment, and for this event, for example, they have made the service a little easier to use for people without smartphones. …a Google Earth mashup with new satellite imagery. We’re also constantly updating a master map (in Japanese and English) with other data such as epicenter locations and evacuation shelters. 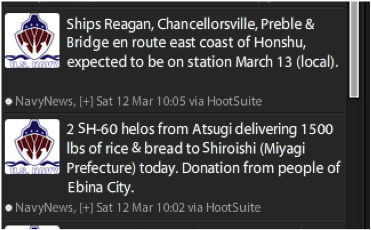 And with information from the newspaper Mainichi, we’ve published a partial list of shelters. We’re also working with our satellite partners GeoEye and DigitalGlobe to provide frequent updates to our imagery of the hardest-hit areas to first responders as well as the general public. You can view this imagery in this Google Earth KML, browse it online through Google Maps or look through our Picasa album of before-and-after images of such places asMinamisanriku and Kesennuma. 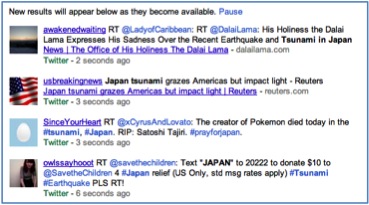 Social Media and the Japan earthquake: What we can learn. 1. People are using social media to determine the whereabouts and well-being of their loved ones. Patty Johnson’s son, Aaron, lives in Tokyo with his wife, who is seven months pregnant. “It’s just worry, worry, worry,” she said. “Is he OK?” The story recounts how after several hours of waiting news comes that their loved one is OK, via facebook. “Thank God for Facebook,” she said. From Boise: Social Media Proves Reliable communication in a time of crisis. Geoff told KTVB he loves the power of social media. He is excited to be able to connect with media organizations on Twitter for news updates, and also be able to get updates from his dad in Japan on Facebook at the same time. Carol Dunn, an emergency management professional and twitter friend, suggested that social media/tech volunteers should be organized to go into nursing homes that have a large population of Japanese americans. These volunteers could bring their laptop computers and facilitate communications via social networks for residence so they can gain information about friends and family. She contacted a Japanese american group on twitter and is currently looking into how to make this happen (maybe with high school volunteers, or crisis commons type volunteers). This is a brand-new idea, but one I think worth pursuing. Social media platforms have become the best way to get information from the scene, and from response organizations (domestic and international). As one example, someone on twitter pointed to a link of videos from the impacted area–which were amazing. I left the computer for a bit and went to the gym. While watching MSNBC, they went to a correspondent who proudly showed a video “just in” which was the exact same video I’d watched an hour earlier. With regard to response organizations, the US military and US Department of State post constant information to their twitter feeds, by monitoring them you can get the information basically at the same time the media is getting it, and the media doesn’t always report each item, so you have more information than you would otherwise. Use a twitter application that can be slowed down or stopped altogether. As Cheryl said last night: “throttle issue is important when a hashtag is blowing up. Tweetdeck usually works, but ability to pause tweets is #priceless” How to do this, from Cheryl again: “use www.twitterfall.com and set the speed or pause the stream until you catch up”. Choose a few power users to follow from the impacted area–for example, government agencies, people in the news media, or just people who seems to be tweeting great info (especially if they are tweeting in your language). You can then create a list to follow. In tweetdeck, here a link to how to do that: “How do I create a new Twitter list in Tweetdeck?” List can also be created in twitter itself and other applications have this ability as well. If you are not on twitter at all, you can go to google alerts and use the realtime function. You can either search a term such as earthquake or tsunami or you can search hashtags if you know them, for example #eqjp or #HITsunami. You can pause the stream as well. If you are not a twitter user, this will also point you to other searches you might want to do, because people often include more than one hashtag in their tweets. The realtime function also includes updates from facebook as well. The timeline feature allows you go back in time and there is a handy list of top tweets. 3. People in harm’s way DO use social media to gain information. I have heard response organizations and local government agencies bemoan their low number of “fans” during the preparedness phase. But, as I have said before: if you build it people will come–especially during a crisis. This was borne out again in Hawaii as a result of the tsunami. 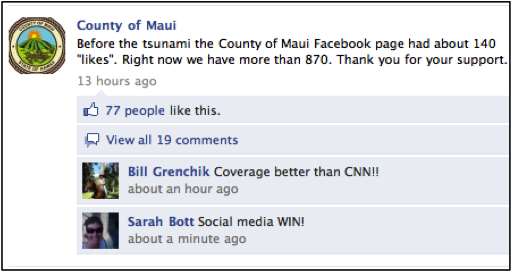 The FireTracker2 reported via twitter that the County of Maui saw a 700% increase in their facebook fans. You can see from the screen capture below that the community was grateful for their efforts. The counties’ page is really quite good, they had a wonderful series of pictures of county authorities rescuing a giant turtle that washed ashore after the tsunami. The community, luckily, received very little damage–and I think it turned out pretty well for the turtle too. This is just a short list of what we are learning but we seem to be learning these same three lessons with each crisis. One last point: social media is not going away. If you are not a social media user, tap into the wealth of information out there and use this event as a way to learn how to monitor these new mediums. Hopefully, if you were on the fence about using social media for your response organization, this example will change your mind. Our thoughts and prayers go out to those affected by this crisis.